Henry of Bolingbroke usurped the throne of England and imprisoned King Richard II. Richard died in prison under mysterious circumstances. King Richard II was believed to have murdered in Pontefract Castle. Richard's body was displayed in the old St Paul's Cathedral for all to see that he was really dead, and he was then buried in Kings Langley Church. So the reign of King Henry IV started under difficult and suspicious circumstances. The Welsh, who always had loved Richard, took up arms for him, and the Earl of Northumberland, who had betrayed Richard, expected a great deal too much from Henry. The earl had a brave son--Henry Percy--who was so fiery and eager that he was commonly called Hotspur. He was sent to fight with the Welsh: and with the king's son, Henry, Prince of Wales, a brave boy of fifteen or sixteen, under his charge, to teach him the art of war; and they used to climb the mountains and sleep in tents together as good friends. But the Scots made an attack on England. Henry Percy went north to fight with them, and beat them in a great battle, making many prisoners. The King sent to ask to have the prisoners sent to London, and this made the proud Percy so angry that he gave up the cause of King Henry, and went off to Wales, taking his prisoners with him; and there, being by this time nearly sure that poor Richard must be dead, he joined the Welsh in choosing, as the only right king of England, young Edmund Mortimer. Henry IV. and his sons gathered an army easily. The battle was fought near Shrewsbury. It was a very fierce one, and in it Hotspur was killed, the Welsh put to flight, and the Prince of Wales fought so well that everyone saw he was likely to be a brave, warlike king, like Edward I. or Edward III. The troubles were not over, however, for the Earl of Northumberland himself, and Archbishop Scrope of York, took up arms against the king; but they were put down without a battle. The Earl fled and hid himself, but the archbishop was taken and beheaded, the first bishop whom a king of England had ever put to death. His reign full of plots and conspiracies. The king never knew whom to trust: one friend after another turned against him, and he became soured and wretched: he was worn out with disappointment and guarding against everyone, and at last he grew even suspicious of his brave son Henry, because he was so bright and bold, and was so much loved. The prince was ordered home from Wales, and obliged to live at Windsor, with nothing to do, while his youngest brothers were put before him and trusted by their father, one of them even sent to command the army in France. But happily the four brothers, Henry, Thomas, John and Humfrey, all loved each other so well that nothing could make them jealous or at enmity with one another. At Windsor, too, the king kept young Edmund Mortimer, whom the Welsh had tried to make king,and also the young English princes, and they all led a happy life together. There are stories told of Henry, Prince Hal, as he was called, leading a wild, merry life, as a sort of madcap; playing at being a robber, and breaking into the wagons that were bringing treasure for his father, and then giving the money back again. 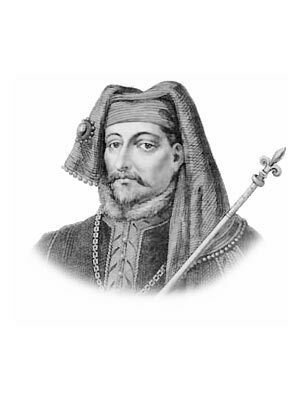 King Henry IV was an old man before his time. He was always ill, and often had fits, and one of these came on when he was in Westminster Abbey. He was taken to the room called the Jerusalem chamber, and Henry watched him there. Henry told his son that, unless he made war in France, his lords would never let him be quiet on his throne in England. Henry IV. died, after having made his own life miserable by taking the crown unjustly. His family is called the House of Lancaster, because his father had been the Duke of Lancaster. Some interesting facts and short biography information about the History, Life & Times of King Henry IV. Additional details, facts, history and information about the famous Medieval Kings of the Middle Ages and important events during their times can be accessed via the Middle Ages Sitemap and the section detailing the life and times of the Kings of the Middle Ages.